50th Birthday Music. 1969 Top Music Hits. 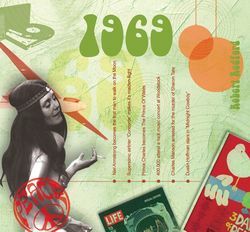 Just the ticket to bring a birthday or anniversary gathering to life is this CD containing 1969 music! You'll get people remembering "when they were young" when they listen to these songs from the big hits. Our 1969 song list includes: 20 Hits Of 1969 - The Classic Years 1. Simon & Garfunkel - The Boxer. 2. Bob Dylan - I Threw It All Away. 3. Nilsson - Everybody's Talkin'. 4. Elvis Presley - In The Ghetto. 5. Chicken Shack - I'd Rather Go Blind. 6. Johnny Cash - A Boy Named Sue. 7. Sly & The Family Stone - Everyday People. 8. Andy Williams - Happy Heart. 9. The Love Affair - Bringing On Back The Good Times. 10. Fifth Dimension - Aquarius/Let The Sunshine In. 11. LaBelle - I'm Gonna Make You Mine. 12. Nina Simone - To Love Somebody. 13. Blood, Sweat & Tears - You've Made Me So Very Happy.14. Johnny Nash - Cupid. 15. Box Tops - Soul Deep. 16. Roger Whittaker - Durham Town. 17. Zager & Evans - In The Year 2525. 18. Clodagh Rodgers - Come Back And Shake Me. 19. Jim Reeves - When Two Worlds Collide. 20. Georgie Fame - Seventh Son. . See also our other 50th birthday presents.